The Archdiocese of Los Angeles and Katy Perry won another round in court Wednesday when a judge removed the final legal obstacle to proceeding to trial in a lawsuit alleging a businesswoman meddled with a contract to sell a former convent in Los Feliz to the singer in 2015. 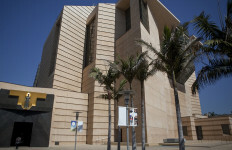 Los Angeles Superior Court Judge Stephanie Bowick denied a motion by Dana Hollister’s attorneys to dismiss some or all of the claims, which center on whether the defendant knew she did not have the written authority of the archbishop to buy the property in 2015, but recorded the deed anyway. The archdiocese and Perry maintain Hollister’s actions forced them to come to court and fight for two years to get Hollister transaction undone. Hollister made the purchase through Sisters Rita Callanan and Catherine Rose Holzman, who maintained they had the authority to sell the Waverly Drive property to the businesswoman. Bowick later canceled the deal. Hollister’s attorneys denied any wrongdoing on her part and said her actions never interfered with the contract between Perry and the archdiocese. “They still have their deal,” said Daniel Allender, one of Hollister’s lawyers. Holzman and Callahan are among five members of the California Institute of the Sisters of the Most Holy and Immaculate Heart of the Blessed Virgin Mary and are the only members who are against the sale of their former home to the 32-year-old “Roar” singer. The property has been vacant since 2011 because it became too costly for the retired sisters to maintain and no longer accommodated their physical needs, and the proceeds from any sale of the property would go to the IHM Institute, according to archdiocese. Prospective jurors were scheduled to be given a questionnaire this afternoon to fill out regarding their ability to serve. The lawyers and the judge will review their answers and actual jury selection is scheduled Monday. The archdiocese started the litigation by filing suit against Hollister in June 2015. Perry later joined the litigation through a cross-complaint through her company, The Bird Nest LLC. The archdiocese is seeking about $3.5 million in damages and Perry is asking for about $2 million. Eric Rowen, the attorney for Perry and Bird Nest, said the singer will not testify or attend the trial, even though she is scheduled to perform during her “Witness: The Tour” at Staples Center on Nov. 7, 8 and 10, overlapping at least part of the trial. The proposed sale to Perry would be for $14.5 million, consisting of $10 million in cash and an agreement to provide an alternative property for a house of prayer worth $4.5 million, according to the archdiocese. In contrast, Hollister paid $44,000 and agreed to a contingent promissory note, archdiocese attorney J. Michael Hennigan has said.